World-renowned golf course architect, Dan Maples, had a beautiful piece of property to work with when he designed The Man O’ War. 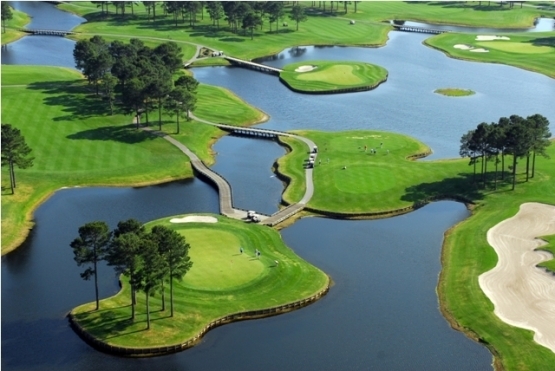 This outstanding Myrtle Beach golf course winds around a scenic 100-acre lake. Water is the focal point on The Man O’ War as it comes into play on 16 of its 18 holes. The water hazards, lateral water hazards and island greens can be very challenging if you don’t control your golf ball. Strategy is very important as you wind your way over the lush Bermuda grass fairways that lead to beautifully maintained Bent grass greens. The greens are simply huge as they average 10,000 sq. feet. The Man O’ War has a marina-style clubhouse, practice range, putting green, practice bunker and chipping area for everyone’s enjoyment. The Man O’ War would be the perfect course to add to your Myrtle Beach Golf Authority golf package. Myrtle Beach Golf Authority offers the very best in Myrtle Beach and North Myrtle Beach golf deals. The finest In Myrtle Beach and North Myrtle Beach accommodations are available with a Myrtle Beach Golf Authority golf package. The many Myrtle Beach attractions are readily available for you to enjoy in the mild Myrtle Beach weather. Book your Myrtle Beach, South Carolina vacation today! Reserve your golf tee times now for Man O’War Golf Club. The warm and relaxing Myrtle Beach weather makes this course along with the other area golf courses a must play during any season. When your round is over, visit Myrtle Beach attractions like the Myrtle Beach Boardwalk and Myrtle Beach State Park. Myrtle Beach golf packages offered here include: golf tee times at both Myrtle Beach and North Myrtle Beach golf courses, transportation to and from the Myrtle Beach Airport, and affordable accommodations at Myrtle Beach hotels, North Myrtle Beach hotels, Myrtle Beach vacation rentals, North Myrtle Beach resorts, or Myrtle Beach condos when available. Plan your next Myrtle Beach golf package and take advantage of Myrtle Beach deals.